Try your hand at a beautiful, classic and modern style of writing! A basic, how-to book for beginners featuring 5 popular fonts or hands, Italic, Uncial, Foundational, Gothic, and Casual Pointed Pen, shown in step-by-step detail. The author, an experienced teacher of calligraphy, builds the letters, numbers, and punctuation, giving over 300 photos for each style, so beginners can see the strokes, how the pen is held, and how the characters take form. Pens, papers, inks—all the tools are covered along with necessary techniques, so beginners can use this workbook approach to build mastery of a full range of hands—from the oldest, most traditional to contemporary—quickly and confidently. 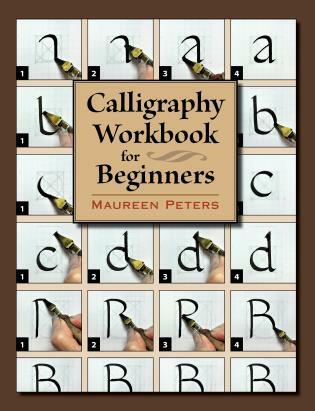 Author Maureen Peters is a member of the Philadelphia Calligraphy Guild and teaches calligraphy at Letterworks Studio. She has been instrumental in developing art curriculum for the New Jersey schools and lives in Woodbury, NJ.